Goplus Treadmill Desk Standing Walking Treadmill Electric Machine W/ Tabletop Height Adjustable Treadmill Workstation Perfect for Office & Home by Goplus at M's Dance Center. MPN: Walking Machine. Hurry! Limited time offer. Offer valid only while supplies last. 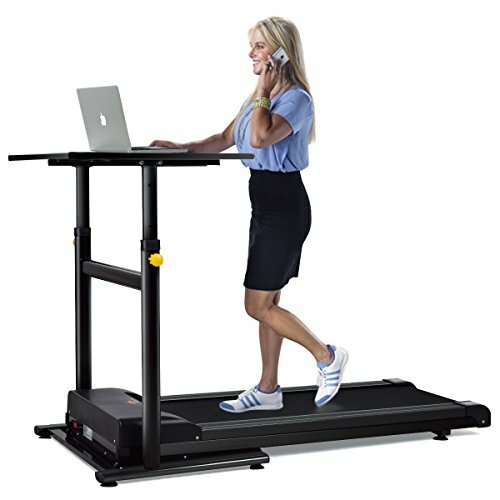 DescriptionOur brand new Treadmill Desk combines office treadmill with standing desk, providing everything you need to begin walking while you work. Our brand new Treadmill Desk combines office treadmill with standing desk, providing everything you need to begin walking while you work. The console is integrated directly within the armrest of the standing desk, providing all the activity feedback you desire, including mode, walking time, distance, calories and speed. Quiet operation lets you stay respectful of coworkers while you walk for miles each day without impacting office productivity. The standing desk adjusts from 39" to 46", allowing you to find proper ergonomic positioning whether short or tall. The wide desktop provides a spacious working area while still leaving enough room for all your office supplies. Don't hesitate to add it to your cart! 【Walking & Working】Goplus Walking Machine is designed with a tabletop, which has large surface area of 31.5" x 23.5". You can focus on your work while doing exercise or just standing on the treadmill. 【Solid Construction】Frames are made of hight quality steel,this walking machine has 220Lbs weight capacity, 63" x 29" (L x W) ruuning belt provides you more comfortable and more sturdy workout experience. 【Tabletop Height Adjustable】5 height levels(from 39" to 46") for the tabletop allowing you to find proper ergonomic positioning whether short or tall. 【Easy Assembly】There are two boxes belong to this walking machine, one box for running belt and one for desk. With instruction it doesn't need much effort to put the machine and the desk together.